Pyramid Rooflights have a stylish and contemporary design, engineered to maximise the amount of natural light. These are popular where multiple natural light sources are required in smaller roofs and corridors; as the interior below is brighter and lighter, which adds volume to your room, giving the illusion of a more spacious environment. They can also add a feeling of character to the design of your property. Available in 3 options; Fixed, Manual Opening & Electric Opening. Rooflights are installed with a supporting upstand / kerb detail. Upstands are used to keep the glazed section of the rooflight off of the roof's surface. Our rooflights can be easily setup to be open & closed via a remote control wireless key fob. This sensor triggers the closing of the rooflight in rainy conditions. The combined wind / rain sensor provides you all the benefits of the heated rain sensor with a wind sensor and temperature sensor. The rooflight is triggered to close in high winds, rainy conditions & cooler temperatures. The thermostat is used for regulating the temperature in your room/s (the switching point can be individually set between 5-30 degrees) and will operate your rooflight accordingly. Fixed Pyramid Rooflights are perfect for letting maximum light flood into any room. Manual Pyramid Rooflights are best suited for those wanting contemporary design with the added functionality of allowing both natural light and ventilation. These are fitted with a telescopic screw-jack opener and supplied with a telescopic operating pole. The screw-jack has an opening stroke at 250mm. 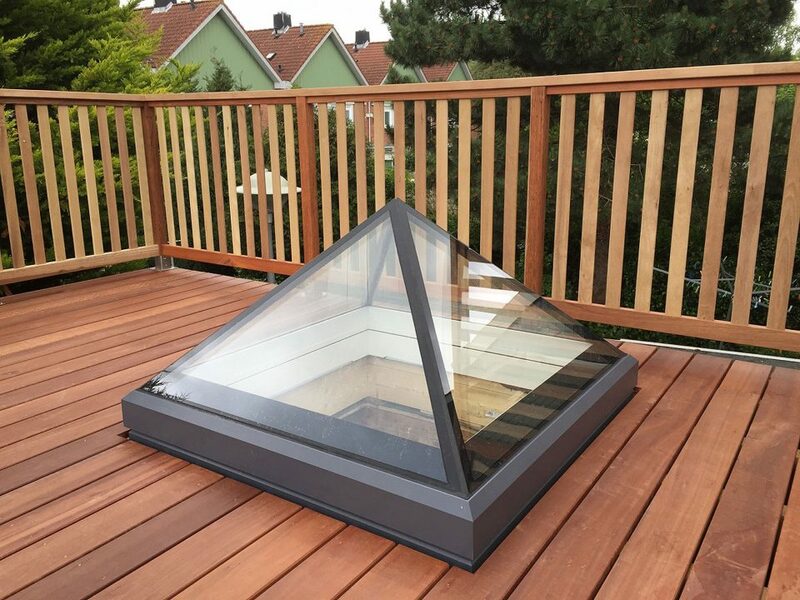 Electric Pyramid Rooflights are ideal for those wanting all of the above, conveniently operated by the click of a switch. These come with a quality concealed opening mechanism, and is easy to operate. It’s factory-fitted with 24v chain-driven actuators which are completely concealed within the frame. NOTES: Dimensions are external measurements & all prices are plus VAT. Also, a fixing kit is supplied with this item, which will include all fixings needed for installation but the Opening (Electric) must be wired in and signed off by a qualified electrician (wiring diagrams will be sent with the rooflight). Delivery within 10-15 working days. We have a large selection of standard sizes available but if you require different sizes please create a Tailor Made option – entering your dimensions and add any available Optional Extras for an instant quotation. Delivery within 10-15 working days* – view full delivery information. If your requirements are outside of these sizes please see call 01223 79 22 44 or email [email protected] to discuss your specific needs in more detail. The Pyramid Rooflights come with a 32mm DGU toughened safety glass with low-e coating and warm edge spacer. The low-e coating allows the suns natural heat (solar gain) to pass through the panes then the low-e coating reflects the heat gain back into the room, which is more energy efficient. The warm edge spacer is made of an insulating plastic composite material that becomes a barrier to heat loss, keeping the edge of the unit warm, resulting in less heat loss. Manufactured from our own 6063-T6 aluminium profile, thermally broken with 32mm polyamide insulation sections to prevent cold bridging and stop condensation. The frames are dual colour, coated with marine grade polyester powder coating; supplied in dark grey (RAL 7015) externally and white (RAL 9010) internally, as standard. They come factory glazed, as one unit for ease of installation, for the best easy to fit solution include our Upstand which will give you the correct fall angle required. To enhance the functionality of the Electric rooflight, we are able to offer a range of additional control options for the Electric option for your convenience including remote control wireless key-fob, rain sensor and combined wind / rain sensor please see our Accessories for further information or call us today. NOTE: Dimensions are external measurements & all prices are plus VAT. If you require any further information or assistance please call 01223 79 22 44 or email [email protected] to discuss your specific needs in more detail. Looking for something a little different? We can design and create a rooflight to your exact specifications.